Does the leadership of your organization look like its members? I once moderated a congregational meeting during which someone bemoaned the “fact” that they were now required to “go find homosexuals” to ordain as elders according to their understanding of changes in the constitution of the Presbyterian Church (USA.) They were mistaken. My denomination’s constitution says that our leadership must “express the rich diversity of the congregation’s membership and shall guarantee participation and inclusiveness.”* In other words, if there are no LGBTQ people in your congregation, then you do not have to elect an LGBTQ person to office – because there aren’t any. And if you have no women in your congregation, you also do not have to ordain any women. Sadly, however, I’ve known wonderful congregations with new immigrant members, former refugee members, unicorn members (adults under 30) and People of Color in predominantly White congregations who are never asked to serve in positions of leadership. Take a look at your congregation. Do your officers express the rich diversity of your church? We do what we think “the young people” want without asking them. We are the kind of church that makes us feel comfortable but we are an uncomfortable congregation for anyone outside that over-60 White demographic. We have no idea how our brand of “hospitality” is actually offensive to those who are not yet with us. We have become irrelevant to our communities. A “rich congregation” doesn’t necessarily have a lot of money. A truly rich congregation is about diversity, and I’m talking about all kinds of diversity from theological to gender to skin color to age. Seeking diversity is fundamentally selfish – not because it’s about institutional survival or coolness quotient – although those are selfish reasons too. Seeking diversity is selfish because we are poorer without it. If everybody looks and thinks like we do, we are missing out on the voices of our neighbors. We are missing out on what is really needed in our communities. We are missing out on our own personal growth and a broadening of our perspectives. My denomination requires representation of all kinds of leaders above the Session (i.e. the governing board.) It’s our own in-house constitutional inclusion rider. But there are many governing boards – not to mention event leaders, educational leaders, hospitality leaders, etc. who exclude certain kinds of people from holding important responsibilities. 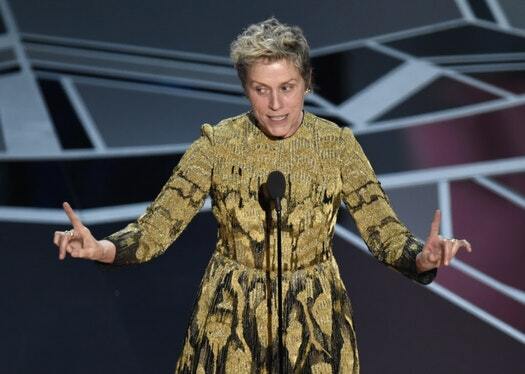 Image of Frances McDormand two nights ago when she won the Academy Award for Best Actress. She ended her speech with two words: Inclusion Rider.